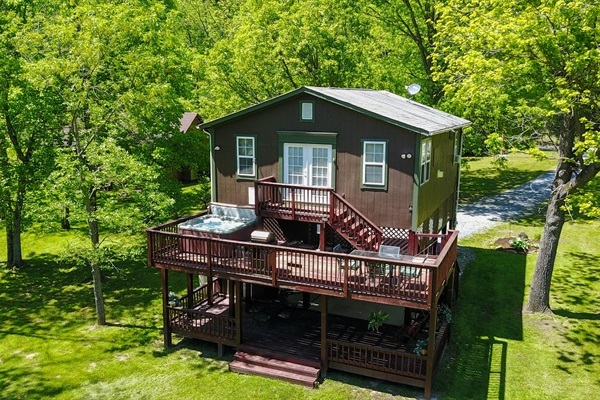 Our cabin at Bear Valley River has everything you want to augment your relaxation in the peaceful harmony of the Shenandoah River. Sit around the campfire with your feet in the river, listening to the calls of 100 different birds. Free canoes sit nearby for your immediate use. Make sure to grab the oars and life jackets from the shed before heading out! A full acre of open yard, from the house to the river, gives you plenty of space to setup your soccer game or volleyball net. A brand new, 7-foot hot tub was recently installed with over 45 jets. This hot tub, from one of the top manufacturers in the business, is great for evening relaxation or morning soak. And while you soak, look out across the river and mountains. On the top level of the deck, a large commercial-grade gas grill is waiting for your hot dogs, hamburgers and steaks. Want a more authentic outdoor grill? In the mood for roasting marshmallows or a late-night chat? We have just the thing. In the middle of the lawn is a stone campfire pit, over 6 feet in diameter. Find all the wood you need next to the shed, and pick up the lawn chairs from inside the shed. The cabin is also outfitted with the best technology has to offer. Satellite TV in every room with 200 channels of crystal-clear satellite service. FREE LONG DISTANCE phone calls. DVD and VCR player in every room. Free washer and dryer. Wireless HIGH SPEED INTERNET access, totally free. We've installed a whole-house filtration system that routes all water from the well directly through a series of five different filters. It also runs through a commercial grade softener. You can drink directly from any faucet in the house (and it might even be better than what you've got at home!). We've even paid for local trash service so you don't have to lug all that stuff home with you.